A dairy farmer from Jaipur said that his earnings have increased by 30 per cent. 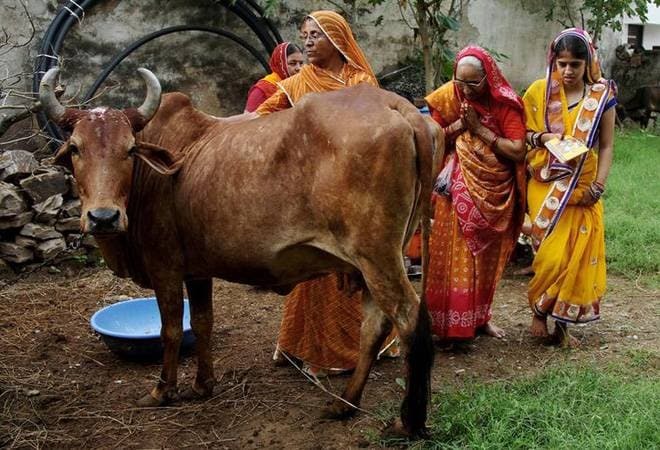 Cow urine is in high demand from people who indulge in organic farming. To witness the exponential demand of cow urine for religious purposes, to "kill negative energy" or for cow urine therapy, one only needs to go to the nearby grocery store, where you are sure to find bottles of cow urine tucked away in the shelves, along with juices and nutritional drinks. Keeping in tandem with the rising demand, cow urine is being sold for upto Rs 30 per litre in Rajasthan. As mentioned in a report in Times of India, cow urine is fetching dairy farmers more than what they get for milk. Urine of high-breed cows such as Gir and Tharparkar is being sold at Rs 15-Rs 30 per litre, while a litre of milk only gets them something between Rs 22 and Rs 25. Kailash Gujjar from Jaipur told the daily that his earnings have grown by 30%. Cow urine is in high demand from people who indulge in organic farming. It is also used for rituals and medicinal purposes. Gujjar, however, has to stay awake at night to make sure that the cow urine does not fall on the ground. He is only one of the many people associated with the dairy industry who have taken to the cow urine business. From households and farmers to large projects, cow urine is in varied scales of demand and fetches such farmers a fortune. For instance, the government-run Maharana Pratap University of Agriculture and Technology in Udaipur purchases cow urine worth Rs 15,000-Rs 20,000 every month for its organic farming project. Rajasthan has around 2,562 state-run cow shelters. In 2016, 500 cows died in one such state-run shelter in Jaipur due to negligence. Following that, Justice Mahesh Chand Sharma of the Jaipur High Court urged the state and central governments to declare cow as the national animal. "It is believed that 33 crore gods and goddesses reside inside the cow... cow is the only living being which intakes oxygen and emits oxygen," he said. Before barging into the lives of Indians, cow urine was a fairly unused product. Apart from a handful of purposes, cow urine was hardly sought by people. Now, however, it is not only widely used, it is also threatening to replace tried and tested medical procedures with myths. For example, biotech scientists from Junagadh Agriculture University in Gujarat claimed that cow urine could cure multiple types of cancer. That was, of course, later refuted by oncologists, who said that they are yet to come across cancer patients who were cured of their ailment after consuming cow urine. While the faith in cow urine to cure cancer might have been curbed, there is a general faith on its healing and cleansing properties. To facilitate that, in May 2015, Rajasthan medical and health minister, Rajendra Rathore, inaugurated a cow urine refinery at Jalore. "There is a pressing need that we explore the scientific concepts behind traditional medical practices and undertake research for treatment of various diseases by combining them with the cow products," he had said then. Pushing this move forward, Rathore also had said that a by-product of cow urine would be used for cleaning at the SMS Hospital in Jaipur. Moreover, Head of Pathmera Gaushala, Dinesh Giri Maharaj, had added that pesticides, that would prove to be a boon for organic farming, would be prepared using the cow-urine extract.